Darn Good Chili is my go-to when it’s cold and gray outside. 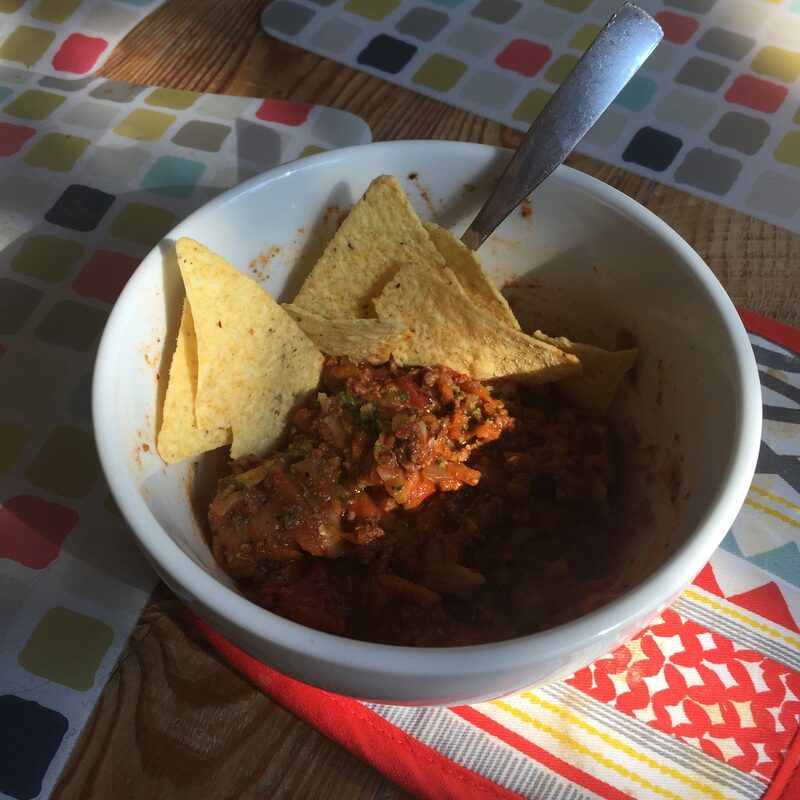 What’s better than a warm bowl of chili topped with a few tortilla chips and a dollop of guacamole? The best part of this recipe is how flexible it is. Add or subtract types and/or amounts of vegetables. Use ground venison or bison instead of ground beef. I’ve even eaten it for breakfast…..not your typical morning fare, but it’s a great alternative to traditional breakfast food. Follow this perfectly, or change it up however you want. I don’t think I’ve ever made it the same way twice, and it’s always been good. 2-3 cups chopped, grated or diced vegetables. I usually use a combination of carrots, sweet potatoes, yellow squash and/or zucchini, depending on what I have on-hand. Check and stir every so often, adding more water or beef broth if it gets too thick. It’s not meant to be soup-y, however, you don’t want it to completely dry out. I always serve chili with grated cheese and Fritos. I really like sliced avocado with this recipe, as well as a dollop of sour cream. My version is pretty mild on the spicy-scale, so add more chili powder or red pepper flakes, or serve with a few splashes of your favorite hot sauce if you prefer more heat. I had all of these ingredients on hand (with the exception of diced tomatoes), so I tried this out for dinner tonight. I subbed Rotel tomatoes in place of the diced tomatoes…. it was delicious, but yowza! !, quite warm in the spice department! Next time I will use diced tomatoes, but for those of you that like it spicy, try Rotel tomatoes! Thanks for the recipe… it was very good!